Retractable Crowd Control Tensa Barriers / Bollards. Rent or Hire Retractable Crowd Control Barriers or Bollards. Tensabarriers Hire Sydney, Melbourne, Brisbane, Perth, ... Australia wide! We provide high quality Retractable Bollards/Tensabarriers for rent or hire. Our retractable crowd control barriers (also called a tensa barrier) feature a retractable belt that makes managing queues in cafes, managing queues or pedestrians, blocking of sections and partitioning floors very easy. 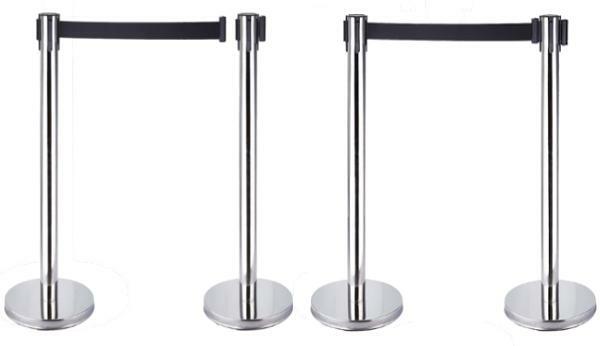 These retractable belt barriers or tensa barriers are common as queue barriers in areas such as airports, banks, museums and many other areas where crowds of people or pedestrians are common and crowd control barricades are a necessity. NOTE: Tensabarrier rental prices are Subject to Change without Notice. We also have a range of Function Tables which work perfectly with our retractable crowd control barriers or Tensa Barrier / Tensabarriers. Click here to find out more. To make an inquiry regarding our Crowd Control Barriers / Tensabarriers for rent or hire, please feel free to contact us either by telephone (on 0418 574 767 or in Victoria on (03) 8420 7788), email or by using our Inquiry/Booking Form. As our available products change regularly, it is not possible for us to list every crowd control barricade option we have on this site. If you cannot find the Retractable Bollard / Tensabarrier you are looking to rent or hire here, please feel free to call us (on 0418 574 767 or in Victoria on (03) 8420 7788), email us or use ourInquiry/Booking Form to make an inquiry. We will endeavour to respond to your inquiry within 24 business hours. We can also sell you a crowd control barrier or Tensabarrier solution for most applications. If you wish to purchase or buy Retractable Bollards / Tensabarriers, either new or second hand Retractable Bollards / Tensabarriers, or just need a price, please feel free to call us (on 0418 574 767 or in Victoria on (03) 8420 7788), email us or use our Inquiry Form to make a purchase inquiry. We will endeavour to respond to your inquiry within 24 business hours.